Hydrogen and Fuel Cell (FCH) technologies and applications both in transport and energy sectors arrive to the market today. Fire authorities' and First Responders' awareness and knowledge of these new technologies are limited at the moment. An adequate training is therefore required to provide knowledge and essential skills on how to handle potential incidents/accidents at FCH systems and infrastructure; how to protect the general public without putting First Responders' own life at risk. The HyResponse, which is a "Coordination and Support Action (CSA)" project, supported by the European Commission Fuel Cell and Hydrogen Joint Undertaking aims to establish the World's first comprehensive training programme for First Responders. Its core is threefold: educational training including the state-of-the-art knowledge in hydrogen safety, operational "hands-on" training on mock-up real-scale hydrogen and fuel cell installations, and innovative virtual reality training reproducing in detail an entire accident scenario, including influence of First Responders' intervention. 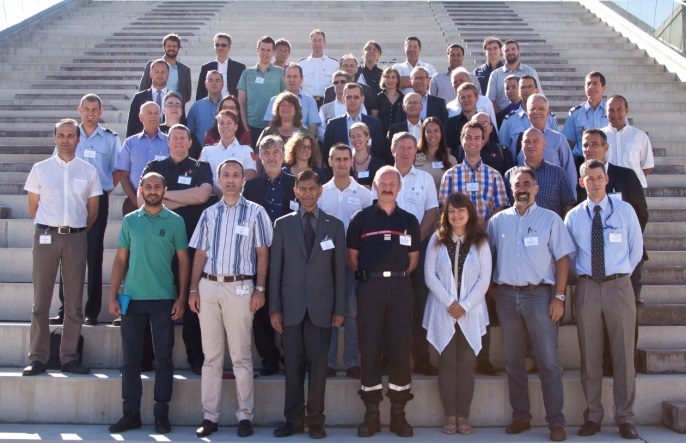 The "First International Workshop on Hydrogen Safety Training for First Responders" organized within the frame of HyResponse project took place on the 3rd and 4th of September 2014 at French Academy for Fire, Rescue and Civil Protection Officers (ENSOSP) in Aix-en-Provence, France. More than 70 participants from the US, Canada, UK, France, Spain, Holland, Syria, Italy, Belgium, Poland, Germany and Slovenia attended the first workshop. The two days event presented the main results and recommendations of HyResponse and shared the experiences on programmes and materials developed in other countries worldwide. Colonel Francis Mene, ENSOSP Director, began the workshop by greeting the participants. He introduced the ENSOSP as well as the main objectives of the workshop. He also stressed the importance of hydrogen safety training for First Responders. The main achievements and development perspectives in the frame of Horizon 2020 were presented by Bert De Colvenaer, Executive Director of Fuel Cells and Hydrogen Joint Undertaking. "We have to be proactive in safety management, work together and share knowledge, draw conclusions and plan the future" he said. It was followed by the "US Perspectives on Hydrogen and Fuel Cells" presented by Kym Carey, Project Manager Fuel Cell Technologies Office of US DoE. "Our analysis efforts explore not just upfront costs though those are very important but also life cycle costs as are used to guide our R&D efforts. We continue to leverage other hydrogen and fuel cell activities in the US and globally to multiply and maximize the impact of our efforts" - Kym Carey said. Ahmed Essam Aly, Communication Manager from European Hydrogen Association (EHA), presented the EU updates and national developments regarding FCH technologies. He said "EHA is working closely with all the national associations and the decision makers to ensure that hydrogen and FC technologies are going to be adapted within the new energy and transportation of each European country national plan". Marc Lopez (project coordinator) and Francois Laumann from ENSOSP, gave an overview of the HyResponse project. Adrien Zanoto, Industrial Risk Management Representative from Air Liquide Advanced Business, presented the topic "Fuel Cell Statistics and Feedback". He also demonstrated videos of experiments that compared an ignition of hydrogen, CNG and LPG. An "Overview of HyResponse educational training programme" was delivered by Svetlana Tretsiakova-McNally from the Ulster University, who presented modules and sections of the developed International Curriculum on hydrogen safety training for First Responders as one of the HyResponse project deliverables. "HyResponse Operational training platform" was presented by Franck Verbecke, AREVA ES. He introduced different HyResponse intervention training platforms with FC and hydrogen, which are didactic system, hydrogen behaviour platforms and mock-up real-scale transport and hydrogen stationary installations. The innovative "Virtual Reality training platform" was presented by Eric Maranne, CRISE. He mentioned that "The virtual training aims to train First Responders in team work assessment of the accident scene and decision making in different scenarios". The first presentations session was followed by a visit to ENSOSP operational training platform where demonstration of fire-fighting operations was organised. The stages of fire initiation, development and extinction through the intervention of the First Responders were compared on four vehicles containing different types of fuel: LPG, CNG, hydrogen pressurised to 35MPa, and hydrogen pressurised to 70 MPa. The demonstration was followed by a visit to exhibition of FC applications at AREVA ES site. Adrien Zanoto started the second day of the workshop with a presentation entitled "Hydrogen Refuelling Station" followed by the presentation of Randy Dey, President of The CCS Global Group, about "Regulations Codes and Standards relevant to First Responders". Franz Petter from State Fire Department and Emergency Medical Service Hamburg introduced the topic of Hydrogen Strategic Planning and he initiated a discussion on "What will happen if hydrogen-powered vehicles are involved in fires?" After that, all the participants visited a virtual reality training centre in ENSOSP where they learnt more about virtual reality simulator, developed within the HyResponse project. In addition, they all were involved in the completion of exercises for two different hydrogen accidents scenarios. Kurt Vollmacher from CTIF (International Association of Fire and Rescue Services) started the afternoon session of the workshop by reporting on the "Purpose and actions of CTIF's commission for extrication and new technology". Steven C. Weiner from Pacific Northwest National Laboratory, Washington, DC had shared the experience gained in the US during First Responder awareness programme. He said: "Collaboration will continue to be an essential element of our future work in first responder training." Vladimir Molkov, University of Ulster, ended the second day by introducing the MSc course in Hydrogen Safety Engineering at Ulster University. "Hydrogen economy depends on public acceptance. To promote public awareness and trust in hydrogen technologies we need well educated and trained staff" - Vladimir Molkov said. A round table discussion finalised the workshop, where Tom Van Esbroeck, CTIF, commented on the need of combining general hydrogen safety training with field training for First Responders and the virtual reality training. The Second HyResponse International Workshop on Hydrogen Safety Training for First Responders will take place on 20-22 April 2016. By this time at least 50 First Responders will be trained by the partners of HyResponse project during three pilot training sessions in a face-to-face mode of one week duration.